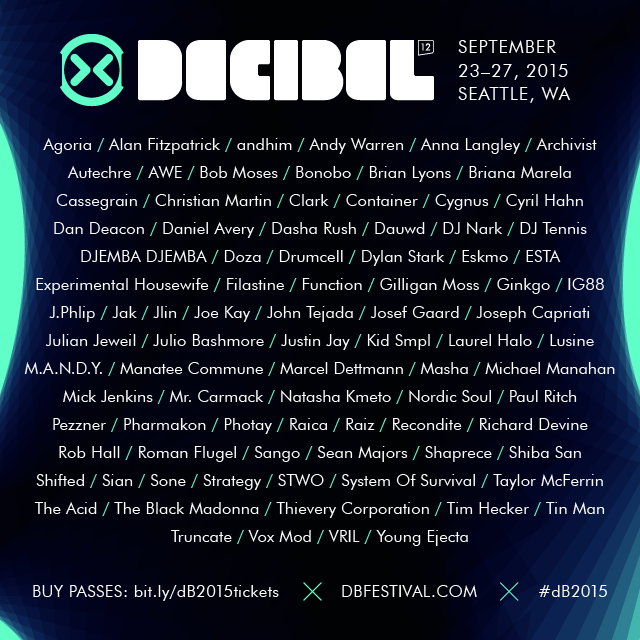 The trip back to my hometown of Seattle for Decibel Festival almost seems like routine at this point, an annual late-September jaunt back to the Northwest to see what the festival has to offer and how it has adapted to the city’s rapidly changing landscape. While past festival’s have proven to be fertile party zones, highlights coming from after hours events and day time boat parties, Decibel 2015 looks to have a healthy dose of the more cerebral side of the electronic music spectrum, acts like Laurel Halo, Tim Hecker and Kid Smpl standing out more than the deluge of house, techno and beats acts that make up the rest of the bill. Of course, Marcel Dettman, The Black Madonna and the indomitable Jlin have us all a flutter, but there’s something about sitting in the Triple Door at 6 PM or catching the early sets at Neumos or The Crocodile that seems especially cathartic this time time around. Maybe it’s the time of year or maybe I’m getting older, but there’s only so much tech house one individual can take. Without further ado, our three most anticipated acts at this year’s Decibel Festival. See you out there. As Chicago’s footwork movement has gone worldwide, more and more artists from the city itself and the surroundings have begun to attract critical attention. Jlin, a Gary, Indiana based steel worker, released her debut album, Dark Energy, on Planet Mu in March and the album still stands up as one of the genre’s most nerve-bending experiments and a record that can hardly be called footwork. Angular, paranoid and full of pent up, raw movement, Dark Energy fits almost seemingly in the void between “body” music and “mind” music, binding a vicious approach to mind numbingly complex drum programming and an almost unrivaled spacial awareness. Jlin wil be performing at the Discwoman showcase, alongside Natasha Kmeto, Young Ejecta, Raica and Experimental Housewife, on Thursday night on Re-Bar. Resident at Chicago’s legendary Smart Bar and now international auteur of all things good and holy in the world of house, techno and disco, The Black Madonna is someone we can all look up to, for her skills on deck, her multifaceted production work and her constant struggle for gender equality in the dance music sphere. One of the most exciting American deejays, the woman born Marea Stamper is something of a jack of all trades, playing party starting sets without coming across ostentatious, work that can be heard in her recent Bunker and Boiler Room podcasts. The Black Madonna plays at the Bottom Forty showcases, alongside Daniel Avery and Nark, on Thursday night at The Crocodile. Everything I could say about Tim Hecker has probably already been said, but the chance to see his full ensemble (I just missed his performance with Tyondai Braxton in Los Angeles) is one of the main reasons for attending this year’s festival. Slated to play in Seattle jazz club The Triple Door, Hecker’s synesthetic, fever dream-esques compositions are truly one of a kind, bringing ambient into the noise world and vice versa. At once deafening, soothing and hallucinogenic, the Montreal artist’s past few albums, especially Virgins and Ravedeath, 1972 have been immensely important to me personally and have served as an entry point to the more abstract, sit down part of the electronic music world. Hecker will be performing at the Dark Overtone showcase, alongside Dasha Rush and Alexander Lewis, on Saturday night at The Triple Door.